The National Bank of Serbia issued Serbian Dinar banknotes in 6 different denominations, including this 10 Serbian Dinara banknote (1941 German Occupation). They are part of the withdrawn Serbian Dinar banknotes World War II series. The National Bank of Serbia started issuing these 10 Serbian Dinar banknotes in 1941. They were withdrawn from circulation in 1942. 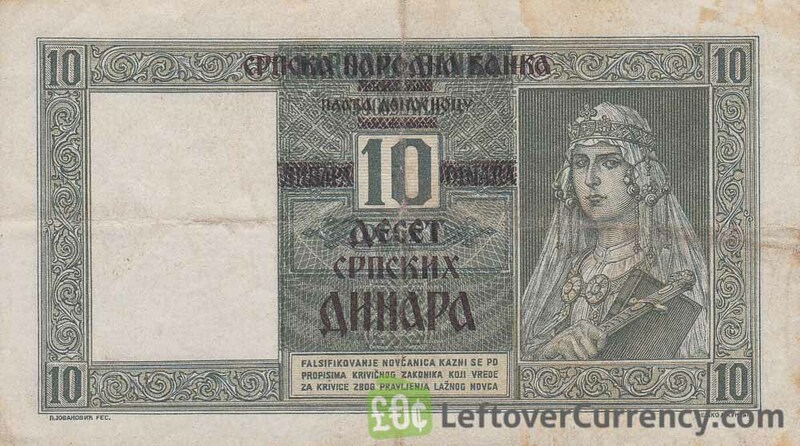 The banknote of 10 Dinara from German occupied Serbia features a woman in traditional Yugoslavian dress. The back side shows the coat of arms of Serbia with the double-headed eagle. Repeat these steps for any other notes and coins you want to exchange. Complete checkout and get paid within 5 days of receiving your currencies. To exchange your 10 Serbian Dinara banknote (1941 German Occupation) for cash: add it to your wallet now!